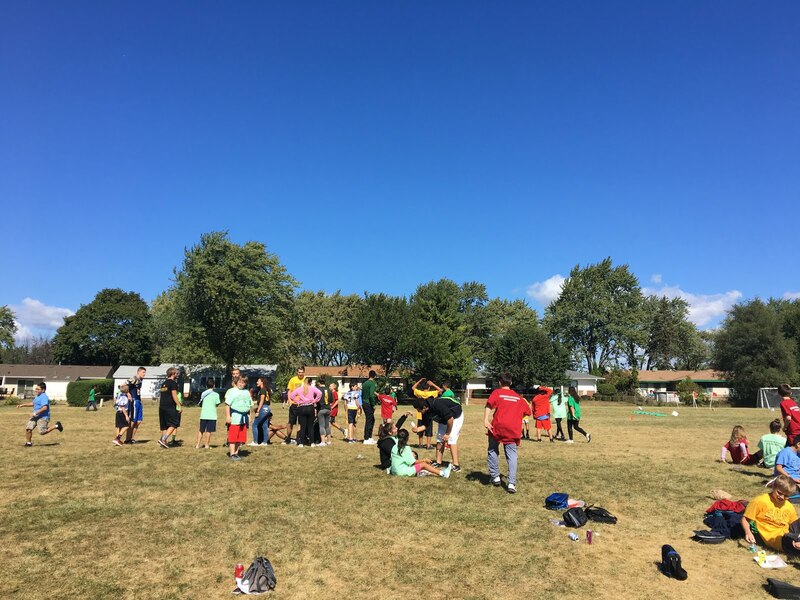 The Collab Blog: Student Leaders Mentor in the Junior High: A Fun Day of Learning for All! Guest writer Natalia Habas is a freshman student at EGHS. She is an aspiring writer and especially enjoys journalistic writing. 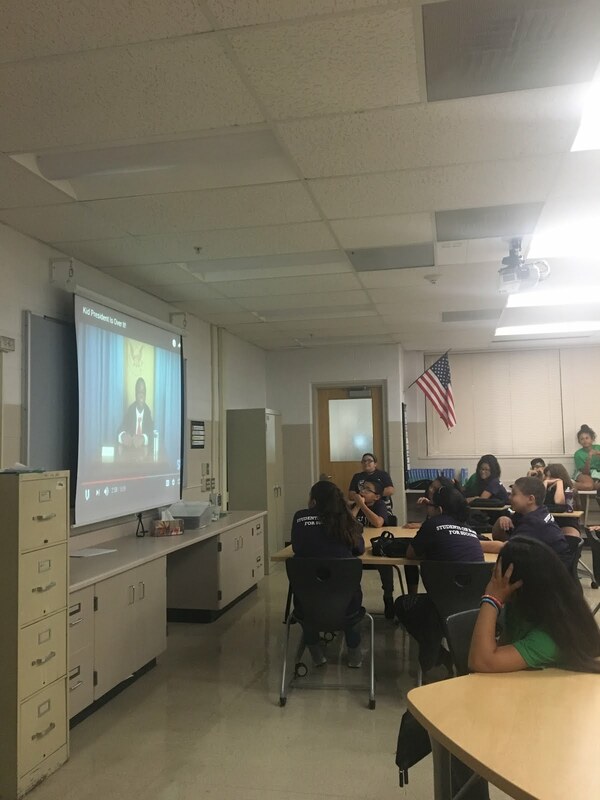 She shadowed the senior mentoring sessions at Grove Junior High School in order to share the experience with the school and community in this Collab Blog post. Mr. Bush’s Leadership Through Service (LTS) class went to Grove Junior High to mentor the 6th grade classes. The senior mentors each got an assigned topic that they would talk about to the students. The purpose of mentoring the 6th graders was to give advice and a personal insight on topics that are important to becoming successful. 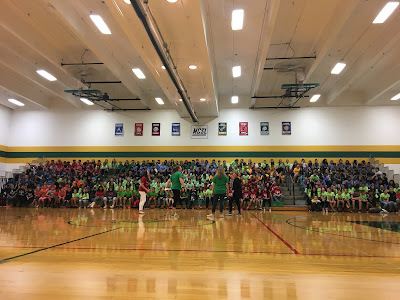 The day at the junior high started out with a 6th grade assembly. 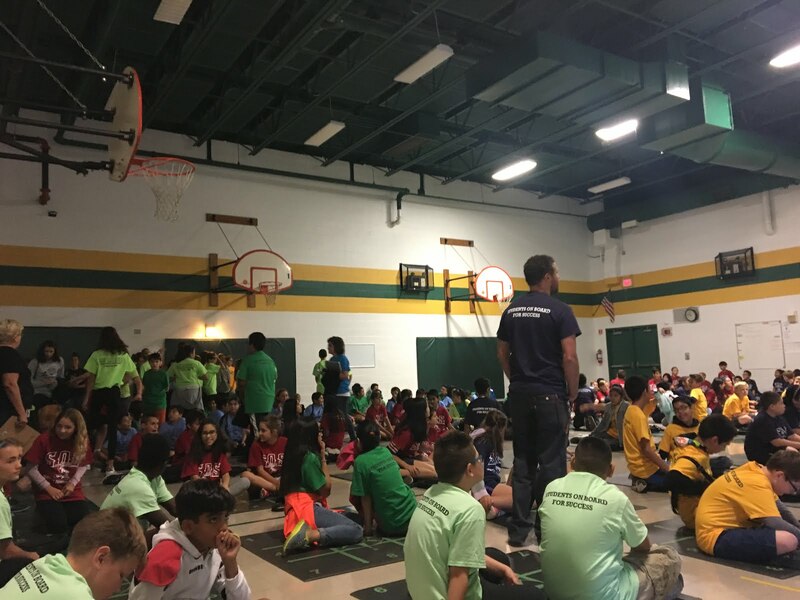 After the assembly, the 6th grade students split into their homeroom classes. 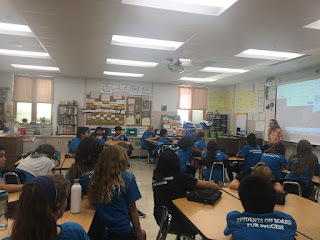 Each class went through a set of rotations that discussed the following topics: study skills, unhealthy relationships, agriculture, a student speaker, exercise, and nutrition. The students also had recess and lunch. One of the skills that the senior mentors discussed was studying. 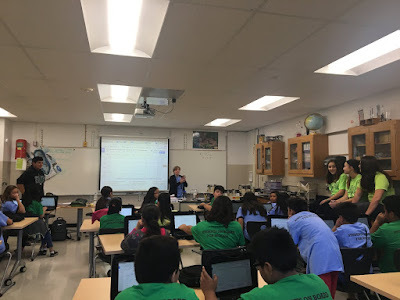 The purpose of the lesson was to teach students how to become organized with their work and to teach them that studying will lead them to becoming successful. The student mentor, Nathan Beltran, started the lesson off by asking the class a question and having students raise their hand to answer. The question was posed to get the students to participate in the discussion and to get them thinking. Throughout the lesson, Nathan compared himself to the students. For instance, he gave an example of how he studies and then asked a student to share their way of studying. He also shared personal experiences to connect with the students. The 6th grade students filled out a calendar to organize their day. The homeroom teacher filled out the planner with the students as the senior mentors walked around and helped students individually. Another topic that was discussed was unhealthy relationships. To begin the lesson, the homeroom teacher brainstormed examples of how unhealthy relationships can affect someone negatively. The mentors used a PowerPoint presentation to teach the lesson. To explain the topic further, the students watched a video on how to make unhealthy relationships healthy. After the video was shown, the teacher discussed the information as a class and reviewed the important parts. The teacher also used Oscar Patino, the senior mentor, to create examples of scenarios that lead to unhealthy relationships. The students split into groups and discussed a scenario of an unhealthy relationship. At the end of the lesson, the class came together as a whole and the senior mentors shared their personal experiences of unhealthy relationships and how they overcame their struggles. Agriculture was also another topic that the 6th grade students discussed throughout their day. Multiple classes joined together for a presentation of how agriculture and farming works. The dairy farmer guest began the lesson by showing a slideshow. The slideshow included lots of pictures and visuals so that the students got a good idea of how it all looks. The students also got to pass around objects that came from the farm itself. For example, the students passed around a bottle used to feed calves and a mix of food. The purpose of the discussion was to teach students about topics that are not usually talked about in school. One of the senior mentors, Jasmine Bautista, volunteered to be a student speaker. She discussed heavy topics that students might be struggling with aside from school. To start, she told her own personal story of struggles and how she has grown from her past. She included examples and specific details to make the students more interested. Jasmine also connected the “heavy” topics to school. Then the students brainstormed a list of things that they personally struggle with. The list consisted the following: low self esteem, child abuse, family issues, anxiety and bullying. Jasmine reviewed each topic and how to overcome it. At the end of the discussion, an inspirational video was shown. “You wouldn't be here if you didn't have a purpose,” Jasmine said. One of the last topics that was discussed was nutrition. The students gathered in groups of 5 and worked through a rotation of 5 different activities. For example, the students created a healthy meal following a food pyramid. Other activities included comparing how much salt or fat is in a specific food. The mentors were each assigned to talk about a certain topic. 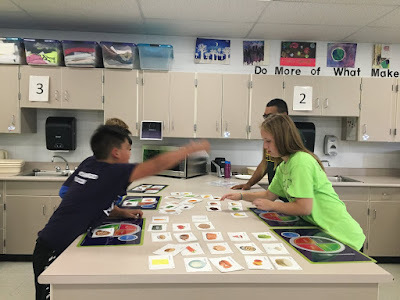 The seniors that were involved, Shuayb Qadri, Aneta Kopacz, Bailey Smola, Alyssa Bonilla, gave real life scenarios to help connect the topic of nutrition to becoming successful. At the end, the students discussed what they learned. 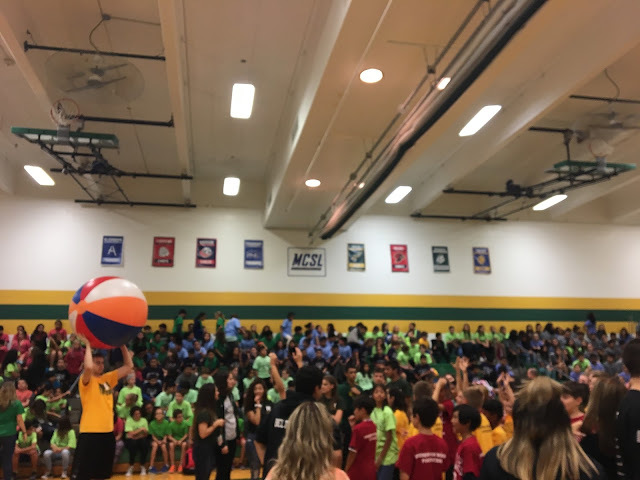 Overall, the 6th grade students and seniors had a day filled with lots of fun and learning. “I think it was really cool getting the opportunity to connect with younger kids and teach them the habits necessary to be successful later on. They're the future of Elk Grove High School and they're already moving in a positive direction,” said Katelyn, one of the senior mentors. 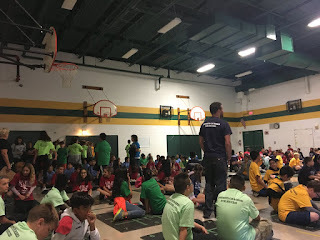 Everyone was filled with positivity and energy and all of the students, mentors and teachers were very encouraging and motivational. The day was very successful. 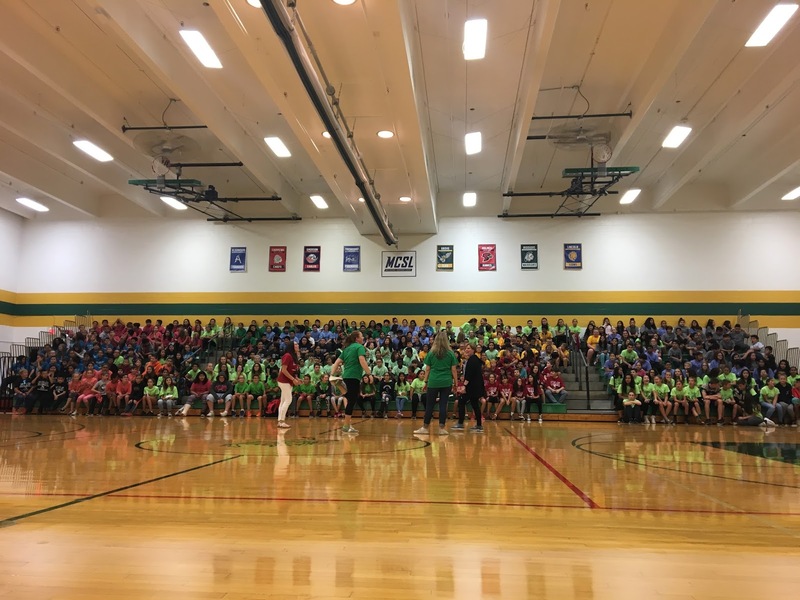 In fact, Mr. Bush and the seniors have decided that they will be returning to Grove Junior High in November to mentor the 8th graders and to give advice about high school. 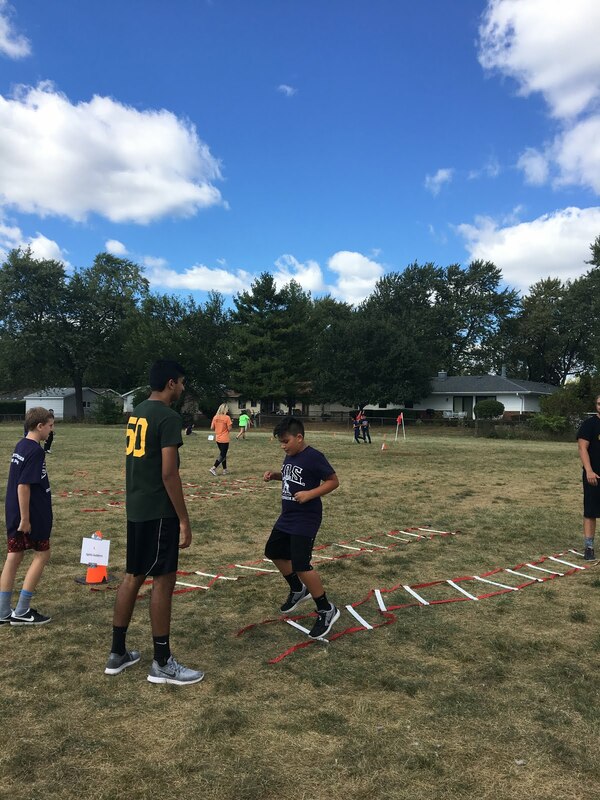 The idea of mentoring 8th graders was already getting started and Nathan Beltran took the lead and discussed the idea with Amanda Pavela, the teacher in charge of the event. “We were talking to the kids and we were teaching them, but since they were 6th graders it would be more beneficial to teach 8th graders because they are closer to high school and they would be more interested in what we had to say,” Nathan said.